The other day I saw Stephanie Cooks post this modified Pioneer Woman Lemon Basil Pasta recipe and it reminded me that I had saved the Pioneer Woman version months ago. So, I somewhat combined both versions to allow a little bit of cheese but still make it slightly healthier than Pioneer Woman’s. While hers may taste even better, this version was really good, especially the marinated chicken. I’ll post what I did. If you want a dairy free recipe, follow Stephanie’s. If you want a creamier pasta, follow the Pioneer Woman’s. Got it? Start by marinating your chicken – add the chicken to a bowl and cover with EVOO, lemon juice, garlic, lemon pepper & salt and pepper. Let it sit at least an hour in the fridge. I put it together & ran to the gym. You could do the same, you’ll feel proud of yourself. Ok, are you back? Bring a salted pot of water to boil and cook your pasta until al dente (or longer if your husband hates al dente, like Mr. Williams). Drain the pasta and set aside. 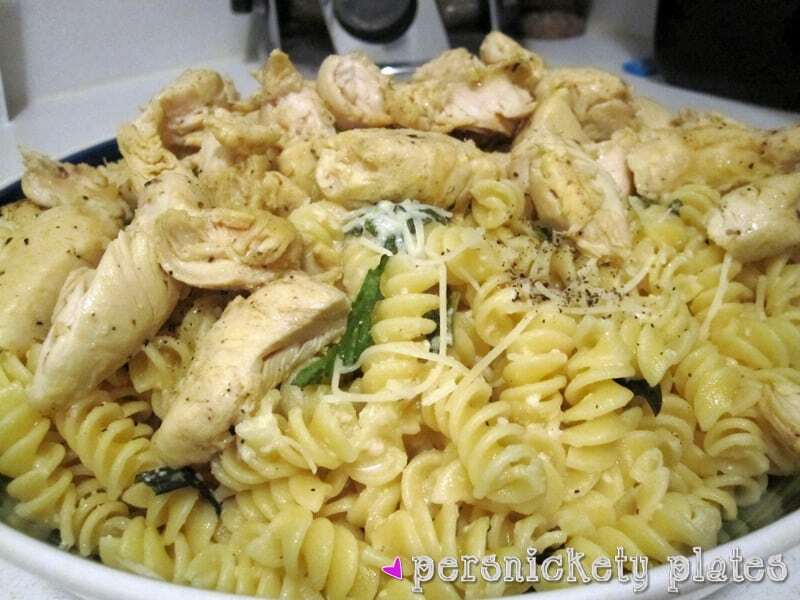 While your pasta is cooking, add some EVOO to a pan and cook your chicken. It’d be even better on the grill but it’s not that warm in Detroit yet. In the same pot you cooked your pasta in, melt butter over medium heat. Squeeze in the juice of 2 lemons – watch out for the seeds! Whisk together. Pour in milk and chicken stock. Whisk until hot. Dump in cheese and whisk until melted. Add salt and pepper. Pour the pasta into the sauce and add the basil. Mix it together and top with the chicken. Sprinkle a little basil and parmesan cheese on top. Mmmmmm, what a perfect spring dish! Sounds yummy and pretty easy. Glad you “translated” the recipe to make it a little more gooey delicious! Mmm that seems really good! I happen to have lemon pepper too!